IN THE SPRING OF 1913, a 23-year-old Salvation Army lass was rushed to the hospital with appendicitis. Her husband wired her mother that her life hung in the balance. For months the young woman had felt her spiritual life also was in peril. Though she had been working in the Salvation Army, she'd had a deep gnawing sense that God expected more of her. In later sermons, she often recounted dramatically what happened in that hospital: her condition deteriorated until a hospital attendant came to move her into a room set apart for the dying. She struggled to breathe as she heard a nurse say, "She's going." Then she heard another voice: "Now will you go?" She understood it to mean she was to choose between going into eternity or going into ministry. She yielded to ministry. Instantly, she said, the pain was gone, her breathing eased, and she soon regained her strength. Within a decade, the young woman would become an American phenomenon. Though hardly known today, during the 1920s, her name—Aimee Semple McPherson—appeared on the front page of America's leading newspapers three times a week. 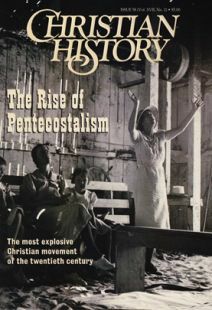 Today historians consider her, along with Billy Sunday, the most significant revivalist in the early twentieth century. Aimee was born in October 1890, to James and Minnie Kennedy, a Methodist and a Salvation Army devotee respectively, in Ontario, Canada. As a teenager, Aimee was introduced to Pentecostalism through the preaching of Robert Semple. Much to the alarm of her parents, she began praying for the baptism of the Holy Spirit. Her prayers were eventually answered, and she quit high school to give more time to the local Pentecostal mission. When Robert proposed, she promptly accepted. She was 17 when they married, but two years later, in Hong Kong, just as the couple began a missions career, he died. Aimee returned from Hong Kong to join her mother and to don the Army uniform. She also married a young businessman named Harold McPherson, who loved her enough to try to go her way after her hospital experience. For a few years, they shared a hand-to-mouth existence. They lived in a gospel car plastered with Bible verses and slogans—Where will you spend eternity? and Jesus saves—and loaded with religious tracts. In the summer of 1917, Aimee began issuing The Bridal Call, a monthly magazine that mobilized her scattered following into a network of supporters and began attracting the attention of the press. But neither adoring crowds nor a friendly press could heal a growing rift between husband and wife. After a short preaching stint, Harold McPherson quietly filed for divorce. Still Aimee was on the upswing. In 1918 she accepted an invitation to preach on the other side of the country. The automobile trip to Los Angeles was an adventure only a handful of intrepid women had undertaken before her. All along the way, she preached, distributed tracts, and visited small congregations. She devoted her energies to the recovery of "Bible Christianity." Using Hebrews 13:8 ("Jesus Christ, the same yesterday, and today, and forever") as her theme, she explained that the "full menu" of Bible Christianity was available for listeners' firsthand experience. She spoke often about the lavish feast Christ offered the faithful and summoned people with the words of a familiar gospel song: "Come and dine, the Master calleth, come and dine!" From Los Angeles in 1919, McPherson launched a series of meetings that catapulted her to fame. Within a year, the largest auditoriums in America's largest cities could not hold the crowds that flocked to hear her. She acquiesced to popular demand that she pray for the sick, and "stretcher days" became hallmarks of her campaigns. Reporters marveled at her oratorical skills: "Never did I hear such language from a human being. Without one moment's intermission, she would talk from an hour to an hour and a half, holding her audience spellbound." Pastors from many denominations threw their support behind her city-wide campaigns. In 1922, her ministry took her to Australia, the first of a number of trips abroad. On January 1, 1923, McPherson dedicated Angelus Temple, which held up to 5,300 worshipers. The ceremonies included hundreds of colorfully clad gypsies (who had named her their queen), a roster of prominent Protestant preachers, and thousands of adoring fans. With a permanent pulpit, new possibilities quickly became realities: a church-owned radio station was launched in 1924, and her Bible school moved into its own building in 1925. "Sister" (as she was fondly referred to) was a citizen of note in a burgeoning city. Angelus Temple floats won prizes in Rose Bowl parades, and the Temple itself became a tourist attraction. Sister's comings and goings from the city's Union Station drew more people than had the visits of presidents and other visiting dignitaries. well-advertised illustrated sermons offered the faithful who shunned nearby Hollywood entertainments a taste of theater. Parades, uniforms, award-winning bands, catchy music, and programs for all ages enlisted people's participation. Ambitious programs to feed the hungry and respond to natural disasters gained goodwill. People responded as well to the motherly qualities McPherson radiated. During midnight forays into Denver's red light districts, she promised Denver's outcasts a bright future if they would be true to themselves. She embraced Winnipeg prostitutes with the assurance that she loved them and that there was hope for them in Christ. In San Francisco's Barbary Coast, she walked into a "dive," sat down at the piano, and got the crowd's attention by playing "Jesus, Lover of My Soul." Popular demand quickly overwhelmed her. People stood in line for hours for seats. A prayer room was open around the clock, and daytime services accommodated those who wanted to "tarry" for baptism in the Holy Spirit. But hints of problems lay just beneath this flourishing façade. Some complained about Minnie Kennedy exercising too much financial control; others, about her theology (not distinctly Pentecostal; too ecumenical). But the storm that left permanent damage broke in May of 1926. As Sister later told it, she was kidnapped on Tuesday afternoon, May 26, from the beach near Santa Monica and spirited away to a cabin where she was held prisoner. That evening, Minnie Kennedy appeared in Sister's place, led the lively singing, and narrated the slide show. Only at the end of the service did she say that Sister had gone for a swim, failed to return, and was presumed drowned. "Sister is gone," she concluded. "We know she is with Jesus." For the next few days, Los Angeles talked of little else. Thousands walked aimlessly on the Ocean Park Beach where Sister had last been seen. Police devised contingency plans for crowd control if Sister's body were retrieved. An elaborate memorial service was held for McPherson on June 20. Three days later, Sister reappeared in Douglas, Arizona, with a tale of having escaped from kidnappers. The crowds that had mourned her loss prepared a lavish welcome home. On Saturday, June 26, 150,000 lined the route from the train station to Angelus Temple, cheering and wishing Sister well. But some law enforcement officials challenged her kidnapping story. Charges and counter-charges swirled until December when the Los Angeles district attorney acknowledged that he had no case against McPherson. On her daily radio shows, she presented herself as victim—of kidnappers, of a corrupt law enforcement system, of the press, and of hostile clergy. When the focus finally shifted in January 1927, Sister immediately set out on a national evangelistic tour. Her support base remained strong; crowds thronged her meetings. But press coverage changed. In the public's mind, McPherson had lost her innocence, and the images of feminine naivete and purity no longer applied. The months of innuendo left a legacy of unanswered questions that took a toll on her popular image. Sister continued her ministry, but her appeal was less universal and more tied to her version of Pentecostalism. Discontent among some of the Temple faithful erupted into bitter quarrels that the local press turned into media events. She lent her name to various business schemes that failed. Serious illness also plagued her through much of the 1930s. A disastrous third marriage lasted less than two years. Sister's most notable public achievement in the 1930s was a social program. The Angelus Temple's Commissary provided food, clothing, and other necessities to needy families—no questions asked. When the Depression hit, she added a Free Dining Hall, which supplied over 80,000 meals in its first two months of operation. (Today Angelus Temple is home to five ethnic Foursquare congregations, and the Commissary still distributes free meals). In the 1940s, she began barnstorming again, though she continued to battle illnesses. In September 1944, she felt well enough to address 10,000 people in the Oakland Auditorium. The next morning, her son Rolf found her unconscious in her room. Shortly before noon, Sister died of complications of kidney failure and the effects of the mixture of prescription drugs she had been taking. Sister's funeral took place on her fifty-fourth birthday, October 9, 1944. Edith Blumhofer’s biography, Aimee Semple McPherson: Everybody’s Sister presents her life empathetically and thoroughly. You can try to find Aimee’s hard-to-find This Is That at Amazon.com or one of the used bookstores at www.abebooks.com. The Aimee Semple McPherson Resource Center offers images, histories, and works by and about the evangelist. The International Church of the Foursquare Gospel, which Aimee founded, has a page called Our Heritage, which contains a lot of information about Sister's life. Even Aimee Semple McPherson’s grave is online. Edith Blumhofer is associate director of The Public Religion Project at the University of Chicago divinity school. She is author of Aimee Semple McPherson: Everybody's Sister (Eerdmans, 1993).